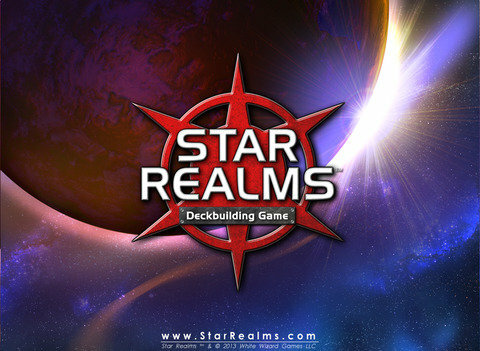 For months now, I’ve been reading reviews and listening to podcasts with glowing things to say about this little inexpensive Kickstarted space-themed deckbuilding game called Star Realms. It has been lighting up the tabletop gaming Con circuit, with some calling it an ““Ascension killer”, which is a bit ironic given that one of the game’s designers, Rob Dougherty was the developer and cofounder of the Ascension Deckbuilding Game. As someone who doesn’t have a regular gaming group, the vast majority of my tabletop gaming is done via my iOS devices, so needless to say I was ecstatic when White Wizard Games announced that they were making a digital version of Star Realms as well. After a few weeks of push-back from Apple’s crack smoking review board, the game finally got approved last week and it did not disappoint. In Star Realms, players start with a basic deck of cards consisting solely of the most common ‘Trade’ and ‘Combat’ cards and the goal is to reduce your opponent’s Authority (health) from 50 to zero by playing cards from your hand. Players take turns drawing five cards from their deck and playing these cards to either purchase better cards from the common center row (using Trade points) or attack their opponent using Combat points to reduce their Authority. Newly purchased cards get added to the player’s discard pile and when he or she runs out of cards in their draw deck, their discard pile is shuffled to form a new draw deck. Cards range in abilities from allowing players to regain some of their Authority, increased Trade or Combat points, draw additional cards, force your opponent to discard cards from his or her hand and more. 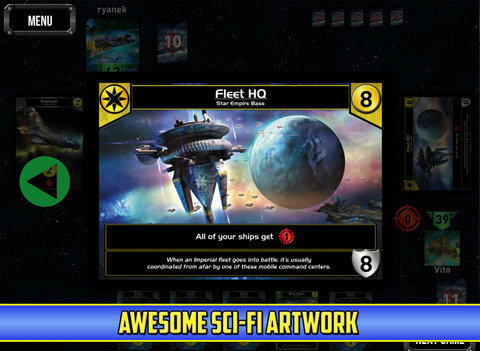 There are also special cards called Bases and Outposts which give players access to additional abilities, Trade, Combat and Authority resources, as long as they are still active on the play area. These cards each belong to one of four factions and these factions can aid in triggering special Ally Abilities and resources on other cards played from the same faction. Ally Abilities can be used as soon as you have another Ship or Base of the same faction in play and can help you launch some monster combos and inflict some serious 20+ Combat damage on your opponent. Bases and Outposts are protected by shields and once played, can only be destroyed if the opponent has enough attack damage to take them out in one go. Outposts (denoted by a black shield) have the added benefit in that they must be destroyed by the player before he or she can do any more direct attack damage on an opponent. As players purchase better cards from the center row (using trade points), the key is to strike just the right balance between increasing ‘Trade’ potential for buying new cards and increasing ‘Combat’ to mount big attacks. Scrapping the basic cards (removed completely from the game) is really important to rapidly cycling through your deck, allowing you to bring out your big guns more often. There is nothing more satisfying than when you get your engine going and see that Combat counter climbing into double digits before you deliver a devastating Combat blow to your opponent. As for the app itself, it is a free download which gives you access to a single player campaign as well as AI match-ups. For a single $4.99 IAP you get an additional campaign as well as two more levels of AI opponents, pass and play for local matches and cross-platform online multiplayer. For that one five buck payment you unlock the entire game on ALL platforms, so pay once and you can play on iOS, Android, Mac, PC and Linux. What a bargain! The interface is really responsive and easy to use and a great four-part tutorial will get you up and running in no time. Plus it warns you when you might be about to do something stupid like ending your turn with unspent Trade, Combat or actions. White Wizard Games did make a few minor concessions in the UI (most likely due to the cross-platform nature of the game) and unlike all of Playdek’s offerings, you cannot simply swipe through your cards, instead there are easy to use left and right arrow buttons on either side of the screen. Not really a big deal for me, but worth noting. Otherwise everything is just a tap or two away. Until you get used to the cards, iPhone uses especially, may be taking liberal advantage of the tap and hold to zoom in on a card feature. The campaigns are super fun, adding a variety of scenarios and opponents with very different tactics and strategies. Once you complete each campaign you can attempt them again on ‘hard mode’ for even more of a challenge. 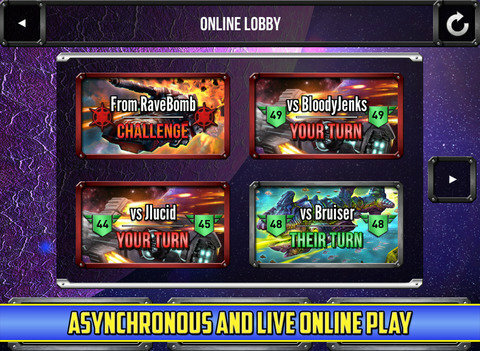 Online play has been really smooth and you get notifications for your turn in match-ups and the app is even kind enough to give you a short replay of your opponent’s last move. This is nice little touch, especially if you have multiple games going or it’s been a while since you made your last move. As a late and only occasional Ascension player, I am finding Star Realms to be a more straightforward and enjoyable experience. With its smaller card set and great iconography, it much easier for me to keep track of everything that is going on w/o having to zoom in on each and every card to read a boatload of small of text. If you found Ascension a little too confusing, I highly recommend giving Star Realms a try. 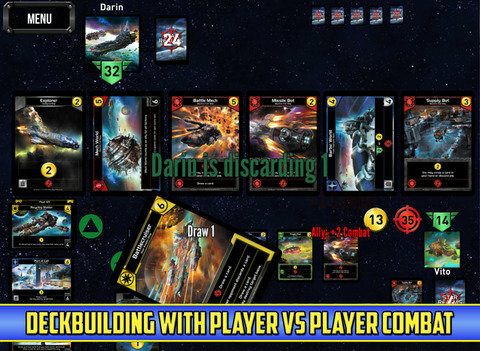 There is plenty of room for individual strategy, and come-from-behind victories are certainly attainable, making this a easy to pick up and play game for newcomers, whether you’ve played a deckbuilder before or not.